Ein auffällig schwarz-weiß gezeichneter kleiner Watvogel steht am südlichsten Ende der Transpantaneira direkt vor dem Wasser. Es ist der Diademkiebitz (Vanellus cayanus). Dieser Kiebitz hat inzwischen einen neuen wissenschaftlichen Namen bekommen: Hoploxypterus cayanus. In Porto Jofré direkt am Nordufer des Rio Cuiabá (auf manchen Karten heißt dieser Flussabschnitt auch Rio São Lourenço) endet nach 145 Kilometern die Transpantaneira. Außer ein paar Häusern, einem einfachen Campingplatz, Anlegestellen für Boote und dem riesigen Gelände des Hotel Pantanal Norte gibt es hier nicht viel zu sehen. Auf dem Fluss dümpeln ein paar Hausboote am gegenüber liegenden Ufer. Flink läuft der weiß-schwarze Vogel vor mir auf dem Sand des Rio São Lourenço. Immer wieder hält er inne und scheint zu zögern, sich wieder in Bewegung zu setzen. Ich lege mich auf den Sand und lasse den Vogel kommen. Mit der Zeit kommt der Diademkiebitz immer näher. Ich beschließe noch im Sand liegen zu bleiben und ein paar Fotos mit dem 4,0/500 auch von den anderen Watvögeln auf der Sandbank zu machen. 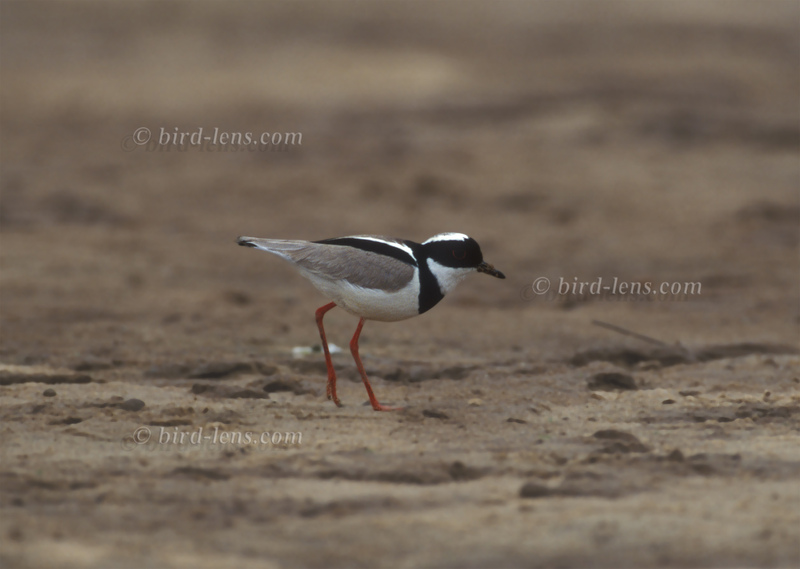 A Lapwing is standing on a sandbar on the north bank of the Rio Cuiabá (on some maps, this section of the river also Rio São Lourenço). 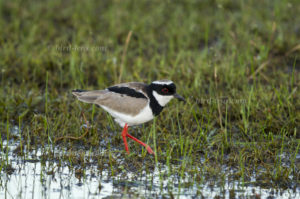 It is a conspicuous black and white colored small wader which obviously uses the southernmost end of the Transpantaneira as his homeground. The Pied Lapwing (Vanellus cayanus) is quite a common bird on sandy shores along the rivers of the Pantanal in central Brazil. In the meantime, this lapwing has gotten a new scientific name: Hoploxypterus cayanus. The north bank of the Rio Cuiabá at Porto Jofré is the end of a 145 kilometers stretch of the Transpantaneira. Apart from a few houses, a simple campsite, boat moorings and the huge grounds of Hotel Pantanal Norte, there is not much to see here. On the river a few houseboats dangle on the opposite shore. Swiftly the white-black bird runs in front of me on the sand of the Rio São Lourenço/ Rio Cuiabá. Again and again the small wader pauses and seems hesitant to start moving again. I lay down on the sand and let the bird come. 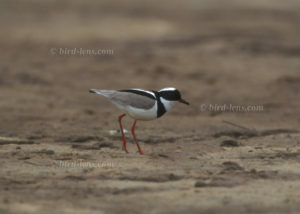 Over time, the Pied Lapwing gets closer and closer. I decide to stay in the sand and take a few photos with the 4.0 / 500 also from the other waders on the sandbank. Despite being at the edge of its eastern distribution, the Yellow-billed Cardinal (Paroaria capitata) is so common in the Pantanal, that you hardly can miss it. Besides being one of the most colorful birds of the Pantanal, it is also one of the most common along the rivers, corixos and bays of the Pantanal plain. Form groups of up to a few dozen in feeders, such as at the farm Pouso Alegre and on the salted meat blankets drying in the sun. The Yellow-billed Cardinal inhabits the riverside in various strata of vegetation. 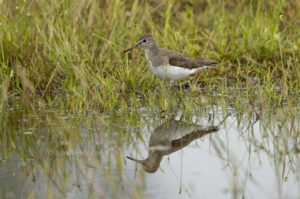 During the flood season, they join the rising waters, reaching places far from the rivers. They colonize farmhouses and other structures created by human action, remaining year-round in the place when there is food. They catch insects, other invertebrates and seeds on the ground. 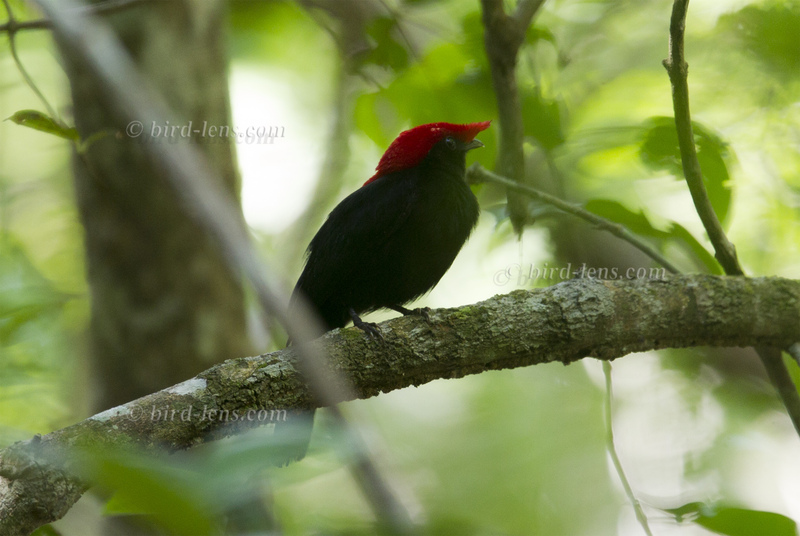 They live in groups throughout the year, although there are strong disputes between them for space or food. 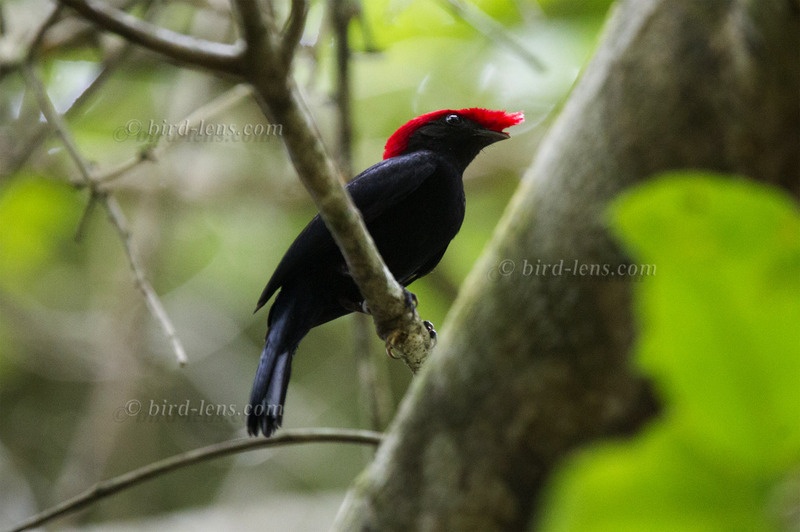 Male and female are identical, with the characteristic red of the head contrasting with the rest of the colors and with the yellow bill. The Blue-crowned Motmot (Momotus momota) is so common in the Pantanal, that you hardly can miss it. Besides being one of the most colorful birds of the Pantanal, it is also one of the most spectacular birds of the Pantanal by the colorful and unique shape of the tail feathers. 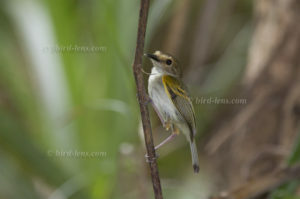 The bird is specialized in hunting insects and small vertebrates from a fixed landing. The song is similar to that of an owl, most often emitted in the lightening and darkening, although it can be heard at any time of day and night. It starts with a short, severe, accelerated call (understood as udu or hard). 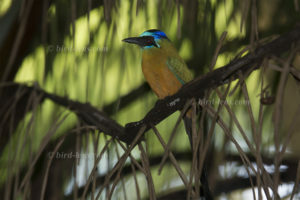 When another Blue-crowned Motmot responds, they accelerate the singing and increase the number of “udus”. Mantelkardinale bewohnen Trockenwälder und Savannen des südlichen Amerikas. Die Verbreitung reicht vom südöstlichen Bolivien, über Brasilien bis in den Norden Argentiniens. Zwischenzeitlich wurde die Art auch auf Hawai eingeführt. Es ist unbekannt, wann oder wie diese Art nach Hawai kam. Die ersten Beobachtungen reichen zurück vielleicht schon bis in die 1930er Jahre. 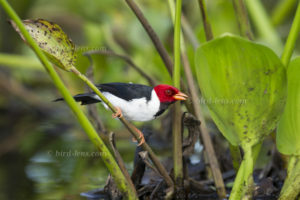 Obwohl er sich im Pantanal am Rand seiner östlichen Verteilung befindet, ist der bunte Mantelkardinal (Paroaria capitata) im Pantanal so verbreitet, dass man ihn kaum verpassen kann. 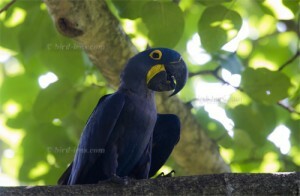 Abgesehen davon, dass er einer der buntesten Vögel des Pantanal ist, gehört er auch zu den häufigsten an den Flüssen, Corixos und Altarmen der Pantanal-Ebene. Immer mal wieder bilden sich Gruppen von bis zu einem Dutzend Vögeln, die an Futterstellen, wie auf der Touristen-Farm Pouso Alegre auftauchen. Der Mantelkardinal bewohnt die Flussufer in unterschiedlichen Vegetationsschichten. Während der Hochwassersaison kommen sie mit der Flut und den ansteigenden Wasserspiegel und erreichen Orte weit ab von Flüssen. Sie fangen Insekten, andere Wirbellose und nehmen Sämereien auf dem Boden auf. Meist leben Mantelkardinale in Gruppen, obwohl es starke territoriale Streitigkeiten zwischen einzelnen Individuen geben kann. 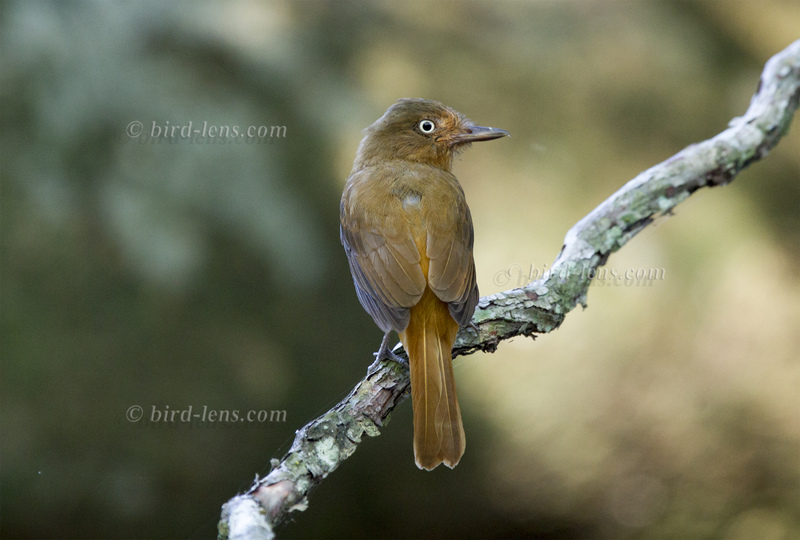 The Rufous Hornero (Furnarius rufus) is so common in the Pantanal, that you hardly think of taking a picture, as you think, that you will do it next day. 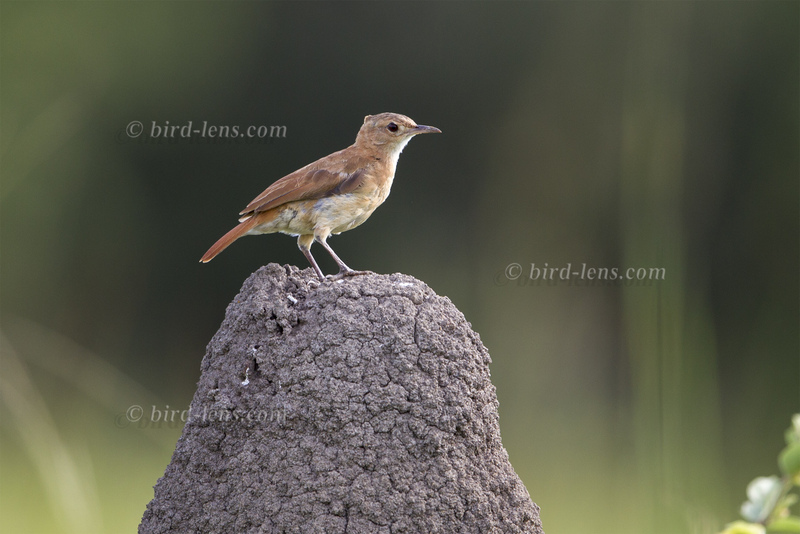 Ok, this time some pictures were shot, when the bird was standing on a termite mound. There is some examination ungoing to study the interaction between birds and termites in Brazil. 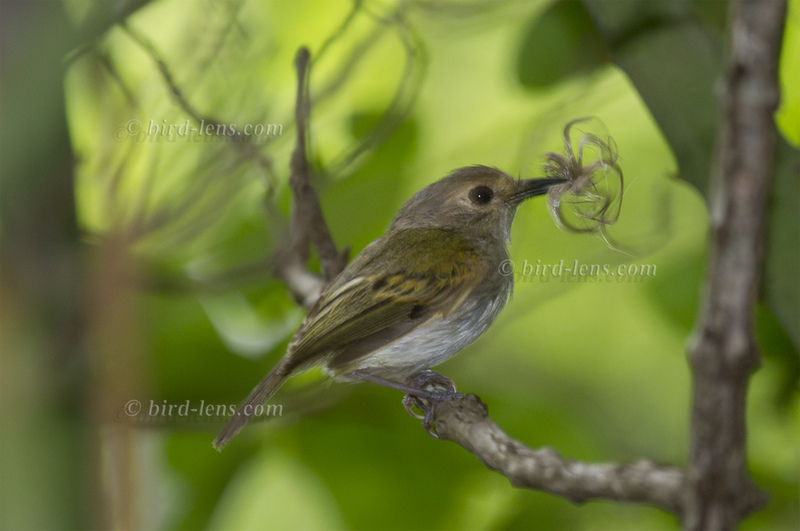 A study found 218 bird species feeding on termites or using termitaria for nesting or perching . 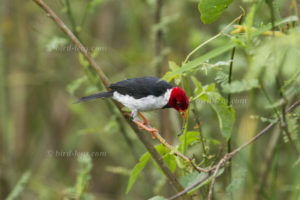 The study found out, that termites are used as a food source are exploited as a nest site for some bird species as well. Some bird species also perch on the top of termite mounds to search for their prey or to conduct territorial or courtship displays.